MONTREAL, Canada -- Ukraine's new government, formed by President Viktor Yanukovych after he was inaugurated in March, this week affirmed that the country's gas transportation network is for sale to no one, including Russian gas monopoly Gazprom. At the same time, Russia has made it clear that it is willing to cooperate with the European Union in any project to modernize the network, which includes more than 60,000 kilometers of pipe plus 71 compressed air plants and 13 underground gas storage facilities. Last year, it carried over three-quarters of natural gas exports from Russia to Europe. Fears were raised during Ukraine's hotly contested election in February that the gas system might be privatized or sold to Gazprom. Presidential candidate and then-prime minister Yuliya Tymoshenko had personally written a law passed by the Ukrainian Rada (parliament) that set out everal different ways in which the gas transportation system could be alienated from state property, and forbade them all in detail. This law has the force of a constitutional provision. In the event, the new government is seeking to work out a "three-sided" plan involving Ukraine, Russia and the European Union to upgrade the network. As the head of the Ukrainian delegation to the European Union, Kostyantyn Yeliseyev, insisted in Brussels last week that his country would maintain ownership of the system, Ukraine's new energy minister, Yuriy Boiko, was beginning discussions with Russian authorities on means to avoid disputes over gas in the future. Russia suspended gas supplies to Ukraine several times in the early 1990s in disputes over non-payment. More recently, in January 2006 (in a dispute with Ukraine over the country's alleged diversion of gas intended for European consumption) and again in January 2009 (in a dispute over the size of Ukraine's gas debt), Russia cut off gas supplies to Ukraine, leading to severe winter shortages in EU countries, since Russian gas also transits Ukraine in large quantities for consumption in the EU. In its talks with Russia, Ukraine has four goals: to renegotiate current prices lower; to reconsider the June 2009 gas bilateral delivery contract; to ensure the "stability and predictability" of gas supply especially via Ukraine to Europe, and to consider options for modernizing the gas transit network. In this last regard, an important normative document was signed with the EU in March 2009 in Brussels, which states that the gas transit system "is and will be" the property of the Ukrainian state. Russian Prime Minister Vladimir Putin had at the time criticized the failure of the agreement, negotiated by the Ukrainian government then headed by Yuliya Tymoshenko as prime minister, to include Russia. Three major international financial institutions - the World Bank, the European Bank for Reconstruction and Development, and the European Investment Bank - are reported to have allocated US$1.7 billion for industrial modernization projects such as the replacement of old compressor stations responsible for important leakages. However, the prime minister has estimated the full cost of the system's modernization to be at least $15 billion to $20 billion. The Russian ambassador to the EU, Vladimir Chizhov, told EurActiv on Tuesday that his country welcomed recent proposals by the new government in Kiev for a "three-sided" plan to modernize Ukraine's gas pipeline network, with Moscow's involvement. Nevertheless, this willingness masks contradictory stakes that are involved. Last month, the first pipe-laying ship for the Nord Stream pipeline left port to begin laying pipes off the Swedish coast. Nord Stream, passing under the Baltic Sea from Russia to Germany, is designed to circumvent Ukraine and Poland. The eventual Nord Stream throughput plus the potential increase in efficiency and security of a modernized Ukrainian gas transportation system to Europe (along with other European sources and those that will come on line in the meantime), make another Russia-sponsored project, the South Stream pipeline under the Black Sea from Russia to Bulgaria, extremely difficult to justify. South Stream is already a laggard in the race to supply gas along the Southern Corridor to Europe (see Locks turn in Nabucco door, Asia Times Online, March 12, 2010). Russia has long sought a financial stake in Ukraine's pipeline system. Over the past 15 years, the pipeline systems of many other countries on former Soviet territory, including in Central Asia and the South Caucasus, have come into Russia's hands. This was often accomplished through the expedient of allowing the country to run up debt for gas imports. Russia would then offer to settle the debt in return for alienation of the national pipeline system. These events has been extensively studied by European and North American academics who have traced them as a conscious strategy for the extension of Russia's geo-economic influence throughout Eurasia. 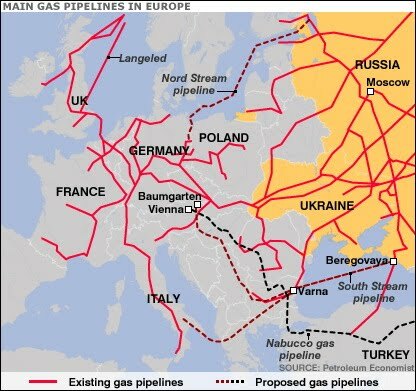 In theory, if Russia or a Russian company owns the pipelines, then it has the right to say whose gas may and may not transit through the system. This is one reason Turkmenistan insists that no Russian firm may become proprietor of any pipeline in the country that it rebuilds or modernizes, such as the East-West Pipeline across the southern part of the country ( see Turkmenistan gas sets Ciceronian riddle, Asia Times Online, October 30, 2009). Nearly 10 years ago, Ukraine and Russia began exploring the creation of a gas transport consortium with European partners for the purpose of managing and modernizing Ukraine's gas pipeline network. Those plans were put on hold after the "Orange Revolution" in 2004-2005 brought Viktor Yushchenko into the president's office. Another factor that might complicate, in practice, Ukraine's goal of maintaining control over its pipeline network while forging partnerships with Europe and Russia, is that there is no such thing as an "EU" energy company, only national companies. If German energy companies are involved, then these have a long history of cooperation with Gazprom and other Russian companies stretching well back into the Soviet era. That is not a problem in itself, but it raises the issue whether Ukraine's national interests will be well respected. Would a German company hesitate to compromise them for financial gain if induced by a Russian offer?